Our archives have been painstakingly gathered by our volunteers or kindly donated to us. Thus we are very protective of them! Your membership donation allows us to record, curate, catalogue and display these records for members and continue the archiving work into the future. We appreciate all the help we can get! If you would like to get in touch with us please us the contact us form. 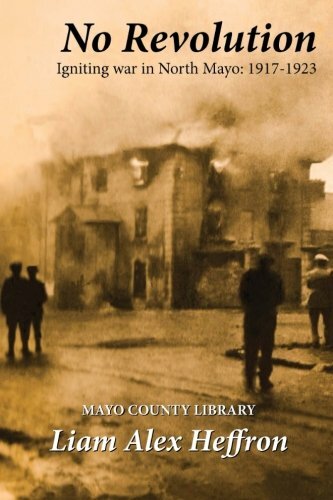 Our founder, Liam Alex Heffron has just published No Revolution - Igniting war in North Mayo, 1917-1923, based on his Masters Degree research into the local events during the War of Independence and Civil War. It has been described by noted historical author Fr Brendan Hoban as: "A ground-breaking and superb local study of the War of Independence and Civil War, of such a controversial time in Irish history. Liam's attention to detail, factual research & concise storytelling make 'No Revolution' a riveting read!" “We had a Mayfly of a Republic, all pitch and promise, but it quickly fell back into the water and carried away broken and dead, and we the worse for it all.” There were certainly revolutionaries fighting and being fought in North Mayo, during 1917-1923. Their political struggle was also driven by a deep hunger for land and social justice - unleashed by the violent collision between Republicans and the British (and later Free State) authorities. This book examines how a rural corner of the west of Ireland reacted, as the social order was severely threatened, during a unique period of modern Irish history - and whether the result was indeed a 'Revolution'.